Prof. Vaibhav Bahadur (VB) is an Assistant Professor of Mechanical Engineering at UT Austin. His research interests are in the areas of phase change, surface science, microfluidics, and energy systems. Prof. Bahadur’s research is targeted at a fundamental understanding of microscale thermal-fluid-particle transport phenomena with applications in energy, water and environmental protection. Specific areas targeted by Dr. Bahadur’s research include phase change heat transfer enhancement (boiling, condensation, freezing), thermal management, waste energy-based water harvesting, and oil & gas – relevant flow assurance phenomena. Prof. Bahadur has a PhD in Mechanical Engineering from Purdue University and a Postdoc from Harvard University. Additionally, he has 4 years industry R&D experience in GE Global Research and Baker Hughes. 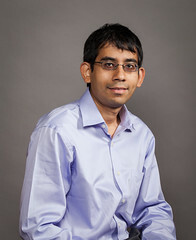 Prof. Bahadur is the recipient of the NSF CAREER Award (2017), the SPE Petroleum Engineering Young Faculty Award (2015), the ACS Doctoral New Investigator Award (2014) and the Google Faculty Research Award (2018). He is the winner of the Society of Petroleum Engineer’s R&D Competition at SPE Annual Technical Conference and Exhibition (2014). Prof. Bahadur has more than 60 journal/conference articles (h-index of 19), 3 patents and 6 pending patent applications. His research has been featured on the cover of ASME’s Mechanical Engineering magazine and ACS Nano, and in R&D magazine. Acharya P. and Bahadur V. Fundamental interfacial mechanisms underlying electrofreezing. Advances in Colloid and Interface Science, 2018. Wikramanayake E., Onur Ozkan and Bahadur V. Landfill gas-powered atmospheric water harvesting for oilfield operations in the United States. Energy, 138, 647-658, 2017. Shahriari A., Acharya P., Carpenter K. and Bahadur V. Metal foam-based ultrafast electronucleation of hydrates at low voltages. Langmuir, 33 (23), 5652-5656, 2017. Hale R. and Bahadur V. Electrowetting-based microfluidic operations on rapid- manufactured devices for heat pipe applications. Journal of Micromechanics and Microengineering, 27, 075004, 2017. Shahriari A., Birbarah P., Oh J., Miljkovic N. and Bahadur V. Electric-field-based control and enhancement of boiling and condensation. Nanoscale and Microscale Thermophysical Engineering (Special issue on Micro & Nanoscale Phase Change Heat Transfer), 1-20, 2017. Shahriari A., Hermes M. and Bahadur V. Electrical control and enhancement of boiling heat transfer during quenching. Applied Physics Letters, 108, 091607, 2016. Wikramanayake E. and Bahadur V. Flared natural gas-based onsite water harvesting for oilfield operations. Environmental Research Letters, 11, 034024, 2016. Bahadur V., Mishchenko L., Hatton B., Taylor, J. A., Aizenberg J., Krupenkin T. Predictive model for ice formation on superhydrophobic surfaces. Langmuir, 27, 14143-14150, 2011. Bahadur V. and Garimella S.V. Electrowetting-based control of static droplet states on rough surfaces. Langmuir, 23, 4918-4924, 2007. Bahadur V. and Garimella S.V. An energy-based model for electrowetting-induced droplet motion. Journal of Micromechanics and Microengineering, 16, 1494-1503, 2006.